What is the Future of UK Solar? IMPORTANT notice about this article: Please note that the Feed-in Tariff (FiT) scheme closed to new applications on March 31st 2019. Growth in the UK solar market halved in 2017 and in July 2018, the UK government announced it would be closing its Feed-in Tariff scheme (which pays solar panel owners for the energy generated by their panels) to new applications in 2019. You’d be forgiven for assuming that the future may not look particularly bright for the solar panel industry, but do these bumps in the road mean we should lose our faith in solar? In 2006, the UK represented just 0.3% of Europe’s total solar capacity with generation at 12 megawatts (MW) out of a European total of 3,400 MW. By 2010 the UK’s solar capacity had grown to 95MW. A possible reason for this is that in 2006 several major high street electrical retailers began to stock solar PV modules for home use, e.g. Currys’ were selling PV modules, manufactured by Sharp, at a cost of £1,000 per module. There was widespread media coverage about the benefits and the technology had become not only more efficient, but also more affordable. However, in 2010 – 2011 our solar power figures multiplied by around by 10 times from 95MW to 965MW with more than 230,000 solar power projects in the UK. Why the upturn? Well in addition to the cheaper priced technology, in April 2010 the government introduced their Feed-in Tariff (FiT) scheme. What is the Feed-in Tariff (FiT) Scheme? Generation Tariff: Payments for every kilowatt-hour (kWh) of energy generated by your solar PV panels. Export Tariff: Payments for energy generated by your system that you don’t use which is then automatically sent to the National Grid. This is measured by an export meter. If you don’t have one then the supplier will estimate that you’re exporting 50% of the total energy generated by your panels. The Feed-in Tariff scheme had a significant impact on the growth of UK solar with thousands of domestic, commercial and industrial installations taking place. In 2012, the government announced that 4 million homes across the UK would be solar powered by 2020 with a total of 22 gigawatt (GW) of installed solar power capacity. In October 2018, the UK’s solar PV installed capacity was 13.05 GW. In 2017 new solar installations halved in the UK for the second year in a row with solar capacity at just 0.95GW, down from 1.97GW in 2016 and 4.1GW in 2015. In fact, UK installations were so low that they caused the EU’s solar growth to flatline at a time when actually record amounts of new solar were added around the world. At the end of September 2018 overall UK solar PV capacity stood at 12,953 MW across 963,764 installations, with just 20% coming from small scale (domestic) 0 to 4 kW installations. When the FiT tariff was reduced significantly at the start of 2016 it removed a big financial incentive for homeowners; installation numbers began to fall and many solar installation companies stopped trading. Then, on 19th July 2018, the Department of Business, Energy and Industrial Strategy (BEIS) announced that the FiT scheme would be closing to new applications sooner than planned. When the FiT was first introduced in 2010, the government estimated that there would be 750,000 solar PV installations eligible for the scheme by 2020. In reality, the scheme combined with the drop in prices were much more effective than that, and 730,000 installations had taken place by 2015. In addition the scheme has been hit by unforeseen funding cuts of around 65%. There are currently no plans to replace the scheme. When’s the Latest You Can Qualify for the FiT? If you’re looking to install solar PV panels before the Feed-in Tariff (FiT) scheme comes to an end on March 31st and receive payments for the next 20 years, there’s no time to waste. Solar panels need to be installed on your home by an MCS accredited installer before the application process can begin. You’ll need to book in the installation working around the installer’s diary which will only become busier as we approach the deadline. The installation shouldn’t take more than 1-3 days, but it’s often more difficult for solar panel installations to take place in winter which could cause additional delays. You then need to apply to your energy supplier for the scheme with the MCS certificate and proof of ownership. The energy supplier will run their checks to confirm your solar PV system is eligible. If successful, the details will be added onto the Central FiT Register (CFR). If your application is successful your energy supplier will send you the terms and conditions to sign before you can start receiving payments on a quarterly basis for 20 years. The time it takes for your energy supplier to process your application will vary. Not all of them disclose the amount of time it will take so we’ve picked out some of the energy suppliers that give a timeframe in the table below. If your supplier isn’t there, we recommend acting as if it could take up to 28 days. First Utility – on the day they receive your application you will be contacted for a meter reading. Utilita – required to wait 14 working days from receiving the application before it can be processed. Note: If you’re already receiving FiT payments you don’t need to worry about the scheme closing. You’ll still receive your payments – the deadline is only for new applications. Getting quotes sooner rather than later could save you from stress in the run up to the March 31st deadline. Get started today and complete our simple form; you’ll get free quotes from up to 3 MCS installers in your local area. So, that’s where we’ve been and where we are, but what about the future? The government’s current solar installation targets set for 2020 are for 24,000 commercial rooftops, 2 million homes and 2,000 solar farms. In addition, there are wider targets for the UK to be ‘carbon neutral’ by 2050. But if we no longer have the incentive of the FiT scheme, what’s going to help us get there? Solar industry professionals advocates are hoping the continuing fall in the cost of panels, and supporting technologies such as household batteries, electric cars and smart technology will save the day. Household solar batteries such as Tesla’s Powerwall or the Powervault 3, for example, enable people to consume rather than export their solar electricity, which means they can make use of more of their free energy and buy less from their supplier. “It seems sensible that new build houses will simply adopt solar and storage as part of the initial building of the property. If the energy prices move like I think they will do, it would be a severe disadvantage trying to sell a house without it. EV is probably going to be the big game changer as to how we think about energy. “Up until now, we’re sort of conditioned to just pay a bill and not necessarily think too much about the energy we consume. It’s totally understandable. Importing electricity is still relatively cheap. But, as we stop paying tax on fuel, as we all move to EVs and our energy usage doubles, it will naturally put a spotlight onto just how many kWh we’re consuming. Why Should We Be Investing in Solar Now? While the number of homes installing solar has dropped since 2016, that doesn’t mean installations have stopped completely. The cost of solar panels has come down by nearly half over the last few years. In 2011, the average cost of a 3.6 to 4 kWp system would have been around £12,000. By the middle of June 2017, that cost was down to just under £6,500 on average. There are some systems which can be installed for just over £4,000. The drop in prices has also coincided with improving technology as solar panels are more efficient than ever and batteries more widely available to maximise their energy saving benefits. We now have a huge range of solar technology designed to make the sun’s energy a viable option for as many people as possible. From standard on roof panels to panels which are integrated into the structure of the roof and even complete solar roof replacements. And for homes which can’t install panels on the roof there is now ground based solar such as the GPS tracking system, Heliomotion. More affordable solar batteries and electric vehicles are giving us even more incentives to generate our own solar electricity. Although the FiT scheme payments are much lower than they were in 2010, you can still earn around 4p per kWh of energy produced by your panels if you apply before the scheme closes in March 2019. That’s 20 years of quarterly payments which could add up to a considerable figure over time. Lessening our reliance on fossil fuels is not just about saving ourselves money, they won’t be here for much longer. The gases we produce are warming our planet and changing our climate in devastating ways, and carbon is the biggest contributor. Since 1990, annual emissions have gone up by about 6 billion metric tons of ‘carbon dioxide equivalent’ worldwide, more than a 20% increase. Every day we continue to use fossil fuels to power our homes and cars, we are harming our planet. 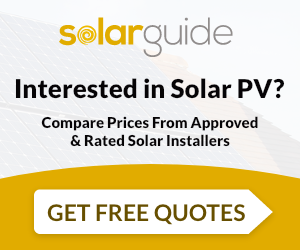 To get solar panels installed so that you can start lowering your energy bills, reducing your impact on the planet and qualify for the FiT payments for the next 20 years, you need to get quotes for solar panels as soon as possible. Complete our simple form today and receive up to 3 free quotes to compare installation prices.